Oceana, Environmental Justice Foundation and WWF have welcomed a new regulation announced yesterday governing the European Union’s extensive external fishing fleet, which operates across the globe and is responsible for 28% of the EU’s total fish catches. After almost two years of negotiations, more than 23,000 vessels will need to follow the same sustainability standards, regardless of where they operate. stop so-called abusive reflagging, where a vessel repeatedly and rapidly changes its flag for the purposes of circumventing conservation measures. ensure that fishing activities under private agreements meet EU standards. Previously those operating under such agreements were allowed to fish without any EU oversight and were not required to meet any EU management requirements. These vessels were operating under the radar, with no public or EU-wide information available on who fishes where. The previous regulation, in place since 2008, resulted in unfair competition among operators, and prevented EU authorities from ensuring that vessels were fishing legally and sustainably. The new law removes these inconsistencies, and ensures that all vessels are subject to the same rigorous requirements in order to fish outside of EU waters. “The new rules are a major step forward for global transparency and the fight against illegal, unreported and unregulated (IUU) fishing. The EU is leading by example and now others must do the same in all corners of the fishing world. Only with greater transparency can we eradicate IUU fishing, rebuild the world’s fisheries, and help the developing countries that depend heavily on this natural resource”, said María José Cornax, Policy and Advocacy director at Oceana in Europe. “We strongly commend the European Union on these new measures to ensure the sustainability and accountability of its external fishing fleet. By implementing this new Regulation the EU will continue to lead the way in the global fight against illegal fishing. We now look to other countries to take notice and follow suit, putting in place similarly stringent standards for their vessels. Of great importance will be action to make the data on where these vessels are fishing public for all to see. By doing so, they too will take vital steps to protect the rights of legitimate fishers and safeguard our oceans for the communities that rely on them for their food and livelihoods,” said Steve Trent, EJF Executive Director. “WWF welcomes these progressive and ambitious fisheries governance policies which will undoubtedly benefit people, coastal communities, fish stocks and marine ecosystems. Europe is demonstrating its commitment to lead on sustainable and equitable international fisheries governance and to combating illegal fishing activities anywhere in the world,” said Dr Samantha Burgess, Head European Marine Policy, at WWF-EPO. All above-mentioned organisations are part of a coalition of NGOs* pushing for an ambitious reform for the EU external fleet and that welcomed the agreement. French, Italian, Portuguese, Spanish and UK vessels operated in the Indian Ocean (in IOTC area, and under official EU access agreements with Comoros, Madagascar, Mauritius, Mozambique and Seychelles). http://www.whofishesfar.org/case-studies/new-data-on-european-union-external-fishing-fleet-more-transparency-in-world-fisheries www.whofishesfar.org shows that between 2008 and 2015 a total of 19,772 individual EU vessels were authorised to fish in the ICCAT area. Of this 19,772, almost half (9,988) were Italian-flagged vessels. In March 2016, the Italian government adjusted the number of Italian vessels targeting swordfish in the ICCAT area, bringing it down from over 8,400 vessels in 2015 to 849 vessels. The review of the external fleet Regulation provides member states with a crucial opportunity to ensure that vessels authorised to fish in Regional Fisheries Management Organisations areas are actually active or operating in these areas. 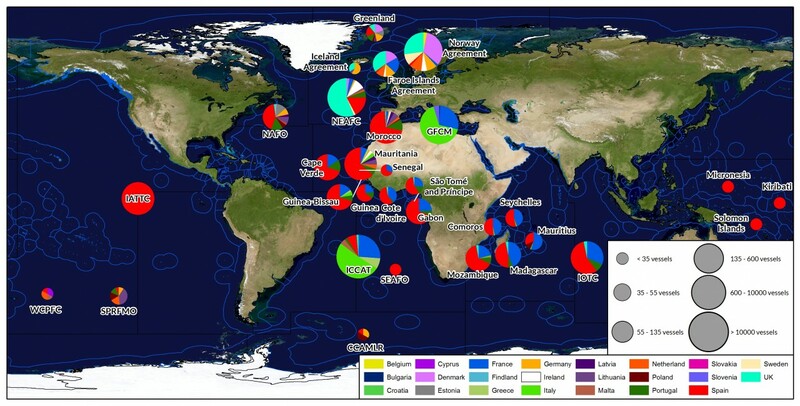 Accurate information on where vessels are fishing and which species they are targeting is vital to ensuring transparency and accountability in global fisheries, and the sustainable management of fish stocks.